Recap: Wow… Where do I start? The blown 23 point lead? The overtime deficits? John Wall? Paul Pierce??? In back to back games versus the Celtics in as many nights, the Wizards came out slow and cold, shooting 0-5 from the field to start. The Celtics were hot starting out 3-4 from the field respectively. 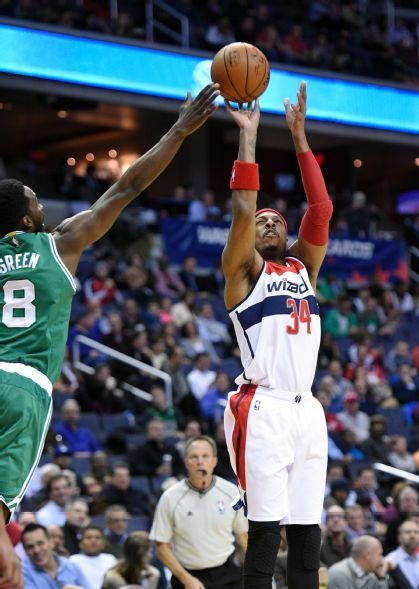 Once again, it was The Truth, Paul Pierce who got the Wizards started scoring their first five points (This is getting repetitive) and 28 points overall on 9-12 shooting… No that’s not a typo, 28 points on 9-12 shooting. Jeff Green, the infamous Wizards killer and Georgetown Alum coming back home, came out hot himself with 12 points in the first quarter. Bench play took over for both teams in the second quarter. The Wizards got some nice play from Andre Miller, Rasual Butler, and Kevin Seraphin. Kevin was very active in the second quarter going 4-4 from the field including a powerful put back dunk. The Professor, Andre Miller utilized his old man moves to post up Marcus Smart and put him in tough defensive positions. Paul Pierce re-entered this game and hit a free throw at the 3:33 mark to move him up to 16th all time in NBA scoring, passing Reggie Miller. Paul received a nice ovation from the crowd. Fitting how it was against his former team right? The Wizards used a nice 13-2 run to close out the half up 13, 58-45. The Celtics bench took over in the 4th playing almost the entirety of the quarter. The Celtics bench scored a whopping 82 points. And I thought the Wizards bench played nicely…. The Celtics bench had four players with 18+ points. The game changed halfway through the 4th when Brandon Bass scored on back to back jump shots and Marcus Thornton who was relatively quiet, had a layup to cut the lead to eight with six minutes to play. The Wizards really started to tighten up. Sloppy passes, uncertain plays on offense, and poor defensive rotations hurt the Wizards in the quarter. It also looked like the Celtics just wanted it more. The Wizards stretched the lead to four on a John Wall jump shot. The Celtics scored a bucket then fouled Kris Humphries. He hits both free throws and the game is over, easy right? Kris splits the two. Down by three with no timeouts; the Celtics push the ball and Kelly Olynyk jacks up a three which is way off. The ball bounces around and ends up in Evan Turner’s hands. He runs to the three point line on the right corner (Very Ray Allen esk) shoots a three and hits it with .6 seconds to play. Game tied at 110. Overtime starts with a quick three pointer by Marcus Smart and some lackadaisical passes resulting in turnovers for the Wizards. The Wiz dug themselves into a seven point deficit and it looked all but over with two minutes to go. John Wall would find Marcin Gortat cutting to the hoop who makes the layup and gets fouled. Lead is cut to four. After a split pair of free throws and a bucket by Evan Turner, the Wizards were down three with under a minute to play. Who else but The Truth knocks down a three pointer at the top of the key with 38 seconds to go to tie the game at 121. The Wizards had an opportunity to take the lead after a missed shot by the Celtics. With a five second difference on the shot clock and game clock, John Wall turned the ball over. Evan Turner pushed the ball to Brandon Bass who shot a layup that rolled off the rim as time expired. Everyone exhale. Game is tied at 121, we’re going to double OT. Double OT was more of the same. Marcus Smart hit a three pointer on the Celtics first possession and the Celtics regained the lead by seven again with 2:39 to play. The Wizards weren’t going to come back from this deficit again were they? John Wall continued to stay aggressive and attack the rim. The first time, he got fouled and split the free throws. The second time down, he crossed over at the top of the key and made an acrobatic reverse layup from behind the hoop to cut the lead to two with 1:30 to play. Paul Pierce hit a jumper in the lane to tie the ball game. Next time down, John drove to the hole once again and got fouled. Once again he split the free throws giving the Wizards a one point lead. With under 10 seconds to play, the Celtics drew up a play up for Evan Turner to take the final shot… He did but it didn’t fall. WIZARDS WIN 133-132. Wiz improve to 14-6 and take on Orlando Wednesday night. 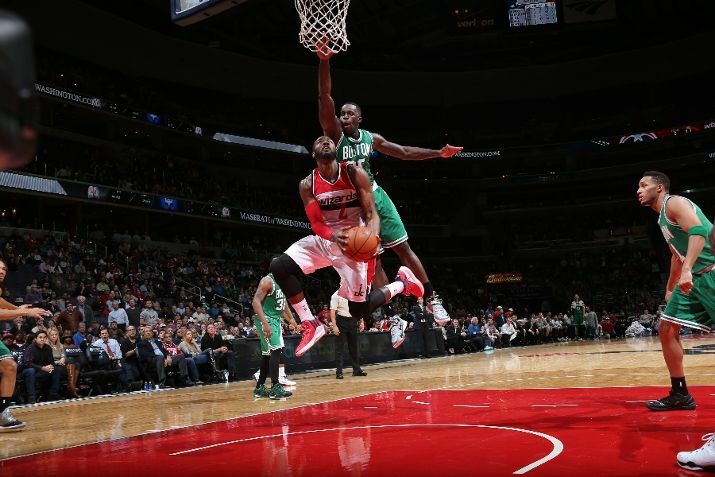 Notes: Once again, John Wall had a crazy stat line of 26 points, 7 rebounds, 17 assists, and 3 steals. As stated, Paul Pierce scored 28 points on a very effective 9-12 from the field. The Celtics bench scored a season high 82 points. Rajon Rondo was held to zero points and did not play after the third quarter.